Yes, you read that right. If you’ve setup a user account and visit your user page, you will now find, at the bottom, a new form for selecting up to 3 books from your user page for comparison. 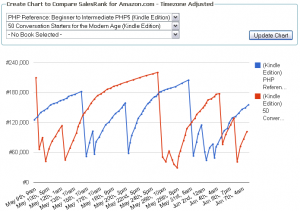 The chart provided will display the salesrank over the past 30 days for all of the books you selected. This allows you to compare how certain titles are doing against each other in the last 30 days. Oh, did you notice something else? Finally, the new chart is timezone aware, much like the RSS feeds on your user page. This allows you to get a more accurate picture of things if you are not located in the Pacific Timezone. This is the first of two planned major improvements coming for NovelRank, and if you have any feedback on this new charting feature, positive or negative, leave it in the comments below. This entry was posted in News and tagged charts, user pages on June 8, 2011 by Mario Lurig.